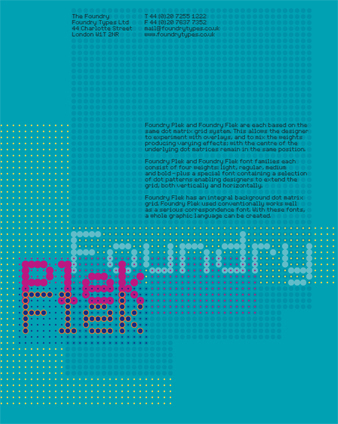 The Plek and Flek families are fonts based on the dot matrix grid system that creates all their letterforms; Flek differs in that it also has this same grid matrix in the background of the letters. In all weights, as the letters become bolder the centre of the dot remains in the same position, allowing different weights to be placed over each other with perfect precision. This allows the possibility of having different colours within the letterforms, and to create a layering effect. Plek/Flek which started a simple idea as how to make a dot matrix typeface using based on a grid 5×9.The other idea was that the dots could vary in size but still adhere strictly to the grid so that you could lay one text box exactly over each other and build up various colours. This idea came from a Una diary cover proof which I had hanging in my apartment. Funnily enough I later bumped into Hans Bochting from Una on the Nieuwemakt in Amsterdam and he asked if I new of a dot matrix typeface he could use in the next Una diary and I said I had been working on one. I gave him a beta version and he used it in the diary, in fact the whole diary revolves round the grid system the typeface is based upon. I also used a version of it on a commission I had for the Dutch post office (TPG) for their summer postage stamps. So the typeface was well tested before its release. It was a nightmare to use in Quark 4 as on screen it jumps all over the place in InDesign it works perfectly. The name was derived from the Dutch word Plek meaning spots and Flek meaning flecks and as it was totally designed in Amsterdam I gave them a Dutch name. The restriction of the 5×9 grid system gives very limited opportunities for designing a letter, one dot added here or taken away is all you have and that is the challenge, that makes it fun! There is another version based on the same dot matrix system as Plek/Flek where all the horizontal dots are joined up, it’s called, Dit /Dat, this/that in English. Along with Rick Sellars, an ex student of mine from the London College of Printing, we used it on a front cover of the English design magazine, ‘Graphics International’. In between Christmas and New Year 2005/6 I completely remade Dit/Dat in 3 days as a sense of euphoric relief that Foundry Context had been finally released and 3 years work was over! Dit/Dat was released in October 2006.